The messy divorce between former Dallas Cowboy Deion Sanders and his estranged wife, Pilar, now centers on their three kids. Deion Sanders is used to playing defense, and that is exactly where he found himself, Wednesday, under cross examination. "Just think about all this stuff you have heard about me, you didn't hear none of this until they started getting their butts kicked in the courthouse," said Deion. Pilar Sander's attorneys grilled the Hall of Famer on everything from abuse to adultery in the battle for primary custody of the couple’s three kids. Attorney Larry Friedman tried to discredit Deion by asking him about driving with a suspended license, an alleged suicide attempt in the 90s, and allowing his girlfriend to spend the night at his house, while he is still legally married. "I filed for divorce because she was the one cheating," said Deion. "I think everyone here knows that." 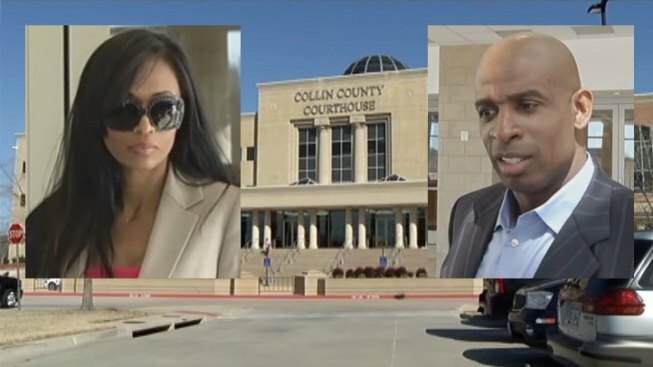 Deion and Pilar Sanders head back into court to discuss custody of their children. After Deion was done, his defense team called Carolyn Chambers, Deion's first wife and the mother of two of his children, to the stand. She testified her first encounter with Pilar was when Pilar called her and said, "I’m seeing your husband." Pilar’s attorney said outside the courtroom, “I think we're looking forward to Pilar getting her story out, I think that is what's important,” said Friedman. What Friedman did not want jurors to hear, an audio recording of a fight between Pilar and Deion's personal assistant. But the judge allowed it, and jurors heard Pilar in a tirade laced with curse words. Pilar took the stand shortly after 4 p.m. and was only on for about 45 minutes before the judge recessed for the day. She will be back on the stand Thursday morning. The kids may have to take the stand, that decision has not yet been made. 36 witnesses are on the list. The trial is expected to late into next week. On Tuesday, Deion Sanders' testimony was at times tearful, angry, and touched on many topics that Deion argued don't have much to do with the Sanders' three children -- including their reality TV show, Deion's Hall of Fame acceptance speech, and the Prime Prep Academy charter school Deion founded. But attorneys for Pilar Sanders said that busy schedule shows Deion Sanders has far too much going on to be a full-time parent. Additionally, attorneys told jurors that the former Cowboy has a split personality. Attorneys for Deion Sanders painted Pilar as a model and actress, and an absent parent more focused on her Hollywood dreams than her three children. VideoDeion Sanders Says Divorce Has Him "Tapped Out"
Deion Sanders argues the battle is all about money. "She only gets a million dollars in the prenup. They've exhausted her to the end. She's not smart enough to see that. The fight for the kids, it's not about the kids. It's about the money," said Deion Sanders on Tuesday. Pilar Sanders claims it's about who's the more reliable parent. "I love my babies. I've done everything for them and with them and anything to keep them happy and doing very well in all they do. I'm mommy," said Pilar Sanders on Tuesday. The Sanders divorce drama has been going on since Deion Sanders announced his split on Facebook in Dec. 2011. Since then, both sides have argued over everything from the prenuptial agreement to alleged assaults and criminal mischief, child support payments and now child custody. Still, no matter how nasty the divorce has been between the Sanders, both Deion and Pilar say they want what is best for their kids. "I have my boys on a daily basis. My daughter's with me all the time. They go back and forth whenever they want, that's the way I am. If you want to spend time with your mom, let's do it," said Deion Sanders on Tuesday. 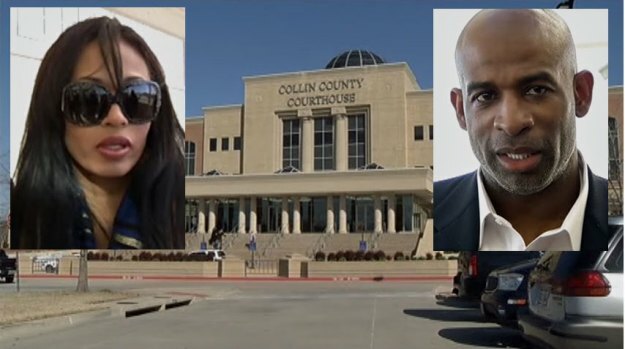 Outside of the courtroom, Pilar and Deion Sanders seemed willing to work out a way to split time with their three kids. "I've never denied them access to their father at all. I believe a child needs both parents, and never withheld my children from having time with their father, and I encourage a lot of time," said Pilar Sanders on Tuesday.